Crowd-what? Anyone who spends even the smallest bit of time on the Internet will at least have encountered the concept of crowdsourcing. It is used by a lot of companies and one hears about it a lot. But do you really know what crowdsourcing is? Do you understand how it affects you, or even if it actually does? The guys from oBizMedia created an infographic that gives us the dish on crowdsourcing. Not really interested? Think again. You just might find some useful ideas from looking into the mechanics of crowdsourcing. Let me present some of the highlights of the infographic. Crowdsourcing is simply the practice of calling upon a large group of people (a crowd) to tackle an issue or solve a problem. Crowdsourcing is also known as fansourcing, crowdcasting, open sourcing, and crowd funding. Some of the biggest names using crowdsourcing: Amazon, Netflix, Wikipedia, and iStockPhoto. Does crowdsourcing pay? According to stats, about 1 million workers have received anywhere from $1 billion to $2 billion for participating in crowdsourcing projects. That is the collective amount, of course. The good of crowdsourcing: you get more ideas, market testing is somehow done as the product is created, costs are cut down. The bad of crowdsourcing: the quality of the product is not always guaranteed, and there is little guarantee of good pay for the workers. While there are certainly downsides to crowdsourcing, there are also benefits, both for the companies and the workers. It is thus no wonder that some of the biggest brands today are turning to crowdsourcing for solutions. 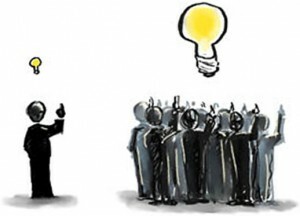 So what do you think of crowdsourcing? As a worker, would you participate in a project without much compensation in return? As a business owner, how can you make crowdsourcing more attractive to workers while at the same time keeping it profitable?